1. Make extra pasta...you may find that you want to add in more to make it more substantial. I always do. 2. Use the highest-quality sausage you can find. I love the homemade sausage at Harmons, our local grocery store. While the recipe indicates "spicy" sausage, I find that mixing half spicy and half mild is best for families with children. 3. Don't scrimp on cheese...meaning, don't use anything but fresh mozzarella, and good Parmesan (we love Parmigiano-Reggiano from Costco); also, add a little extra Parmesan on top for enhanced flavor. 4. 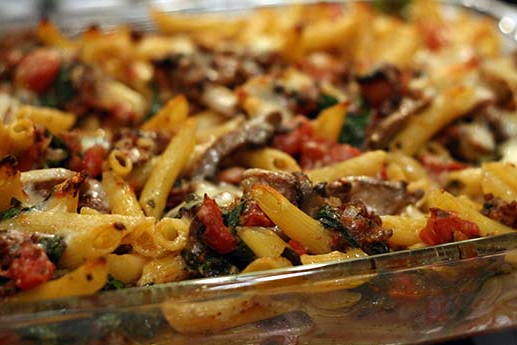 Costco carries a carton of baby spinach that is perfect for this recipe. If you double the recipe, you'll have just enough left over for a spinach salad. P.S. I also made Ina Garten's Peach & Raspberry Crisp this weekend and loved it as well. The only change I made to the recipe was to add an extra package of raspberries. Served with good quality vanilla ice cream, it's pretty much heaven-in-a-bowl. This looks really delicious, I bet it would be a big hit with our kiddos. Thanks for sharing it with us. how much do you think the cobbler serves. there are only four of us in our little fam and wondered if halving this recipe would be a better amount for us. thanks for the recipes....can't wait to try them. looks incredible! can't wait to try it. Yum, yum and YUM! Fabulous recipe... and tips. Thanks for sharing! I made it last night. Super yumminess!!! I got this recipe from your blog a while back and have made it many times. Not sure if I ever thanked you, so "thanks!" It's delish. i made this dinner this week and it will definitely make it to the "eat this on a regular basis" dinner list. it was also passed onto sisters and girlfriends.